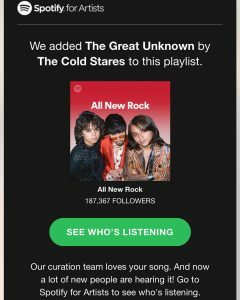 We are excited to announce that the curators at @spotify have added our new single “The Great Unknown” to one of the best rock playlists on Spotify “All New Rock”. The playlist features our friends #blackpistolfire and tracks by #rivalsons and #theraconteurs “The Great Unknown” is also featured in @joebonamassa playlist “Getting Through 2018 Blues” and Spotify’s “Funky, Heavy, Bluesy” and was @classicrockmag “Track of the Week” Check it out in our bio and please add it to your digital library today! Head Bent on Small Stone Records nearing 2,000,000 streams on spotify!